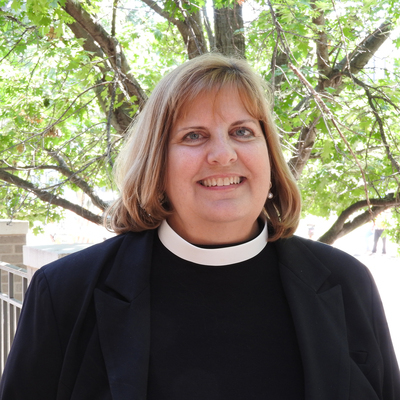 The Episcopal Diocese of San Diego elected the Rev. Canon Susan Brown Snook as its fifth diocesan bishop-elect today at St. Bartholomew’s Episcopal Church in Poway. She was elected on the first ballot during an election that involved 212 voting delegates. She received 71 votes from lay delegates and 45 votes from clergy. Voting delegates, and about 40 non-voting visitors gathered in Poway to worship, sing, and participate in the half-day affair. Voting delegates included both clergy members and laity. All votes were weighted equally. Each of the 43 congregations in the diocese sent delegates to the electing convention. Brown Snook is the first woman to be elected bishop-elect since the diocese was formed in 1973. Others on the ballot were the Rev. Roy Hoffman, DMin and the Rev. Michael Tinnon, DMin, both priests serving in this diocese. The Rev. Canon Susan Brown Snook currently serves as the canon for church growth and development in the Diocese of Oklahoma. She guides churches in areas of evangelism, church growth, church planting, new mission development and planning. She previously served as a church planter in Scottsdale, Arizona. She authored God Gave the Growth: Church Planting in the Episcopal Church and co-founded the Acts 8 Movement, a group dedicated to proclaiming resurrection in the Episcopal Church. In a previous career, she was a certified public accountant. She has been married to her husband, Tom Snook, for over 30 years. They have two adult daughters, Sarah and Julia. Today’s historic election will be submitted to bishops and diocesan standing committees for their ratification. Once those consents are received, the service of ordination and consecration by which Brown Snook becomes a bishop and assumes responsibility for the pastoral and administrative work of the diocese, will take place on Saturday, June 15 at St. Paul’s Cathedral in Banker’s Hill. The Rt. Rev. Katharine Jefferts Schori will be the chief consecrator. A festive reception will follow at The Abbey on Fifth Avenue. The Episcopal Diocese of San Diego is a non-profit, religious organization comprised of 43 congregations in San Diego, Imperial and Riverside Counties, CA and Yuma County, Arizona.